Are you ready to start planning for 2019? 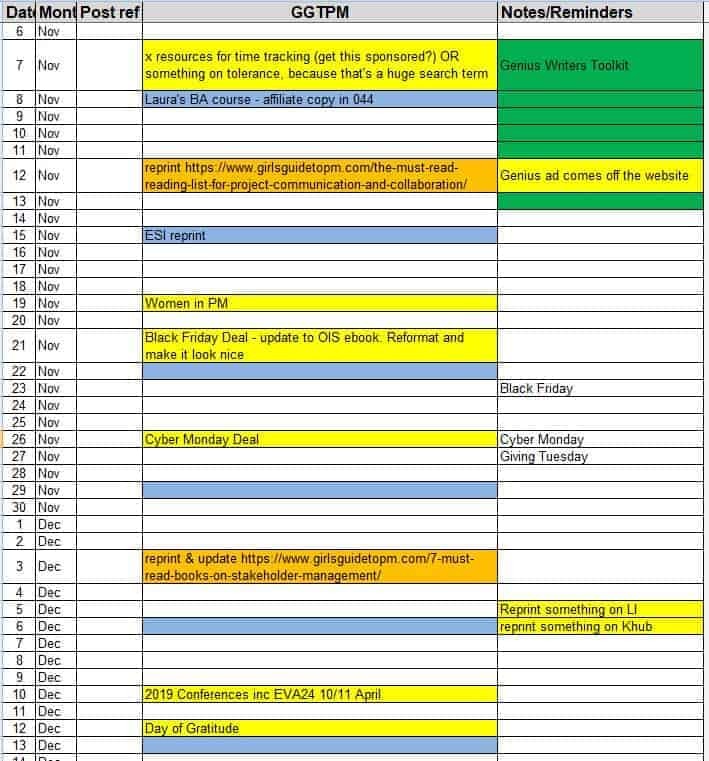 I’ve put together my trusted year-long blog content planner spreadsheet so I can start preparing my content, promotions, themes and more for next year. And I’ve done a version for you too! I should tell you that this is a workhorse of a spreadsheet. It’s designed to show you a year at a glance. If you like pretty pretty printables with rainbow colours and fancy fonts, this isn’t for you (unless you want to add your own). But I would urge you to give it a try. When you see how easy it is to fill in everything you need to do in a year, then I might be able to convince you to move away from folders and PDFs to something practical and designed to keep you organised the whole year through. Planning an overview of your blogging year: monthly areas of focus, affiliate promotions, product launches and more. Planning every blog post so that you can be confident you’ve got enough content to fill the coming months. Planning your email marketing calendar for promotions and your engagement sequences or general newsletters. I find that having everything on one spreadsheet makes it easy to search for what I’ve already done and plan forward. I publish articles on two blogs with two mailing lists, so I’m producing content three or four times a week. Having a calendar that I can colour code lets me see the gaps at a glance. I take the colour (fill) off the cell when the content is scheduled, either in ConvertKit as an email or on the blog via WordPress. I share my version through Dropbox with my VA so that she can see upcoming posts, find them in our shared file structure and load them into WordPress. Then when I check the calendar I can see she’s added a note to say that it’s with me to do and I can hit the Schedule button once I’ve given it a quick check. I used to plan my emails separately, but I kept forgetting to look at the other list, double-booking advertisers and making mistakes, so now I have blog content and emails all on one planner. 2020 Forward Planner, for the ideas that you can’t use this year but don’t want to forget! Plus there’s a worksheet with some notes – feel free to delete those once you’ve read them. This is a highly functional spreadsheet to give you confidence in your content planning. Of course, if you want to prettify it, you can! Add colours, borders and whatever, and you can format it for printing inside Excel too, but I’ve never done that as I don’t work with an offline planner. I’ve been using this spreadsheet for years and it’s only now, working with some blog coaching clients, that I realised no one else seems to do it like this! Trust me, it’s efficient, it’s simple and it works. 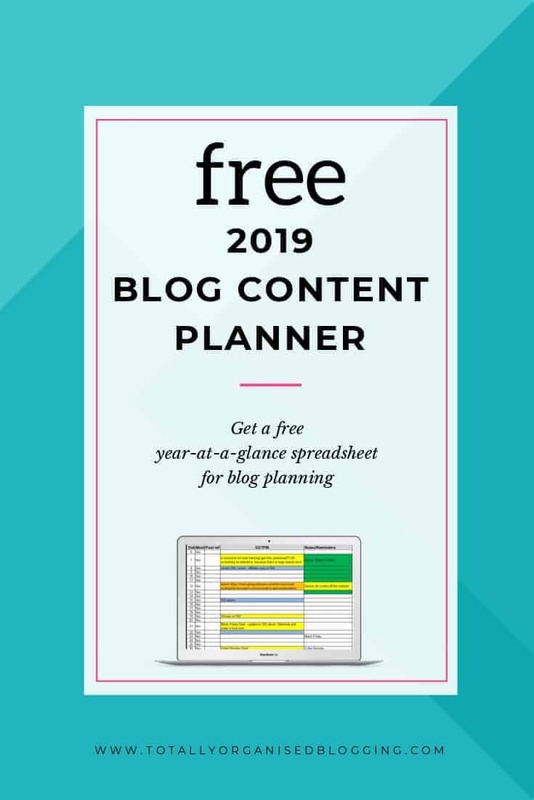 Get a 2019 free blog content planner. This simple spreadsheet will help you organise your blog content for the year.